THE WOODEN ATHLETIC FUND IS DEDICATED TO HONORING THE LASTING EDUCATIONAL AND ATHLETIC LEGACY OF NELL AND JOHN WOODEN. TOGETHER, MEMBERS OF THE WOODEN ATHLETIC FUND PROVIDE INVALUABLE SUPPORT FOR ALL UCLA STUDENT-ATHLETES IN THE CLASSROOM, IN COMPETITION AND IN THE COMMUNITY. Thank you for your generous support of UCLA Athletics through your investment in the Wooden Athletic Fund. Your philanthropic support of the Wooden Athletic Fund plays a pivotal role in our ability to provide our coaches and student-athletes with the resources they need to compete and succeed at the highest levels – both in competition and in the classroom. The Wooden Athletic Fund covers a significant portion of program expenses, including scholarships, academic services, life skills development and recruiting for all 25 of our sports. Through your investment, you are making a direct and lasting impact on the futures of our student-athletes. 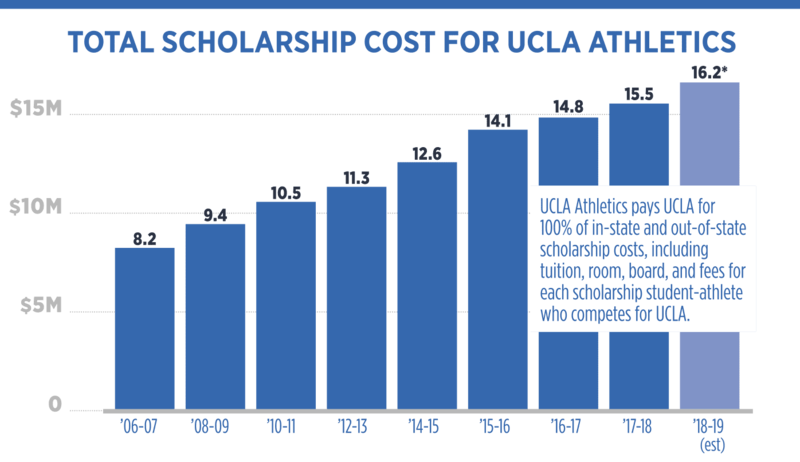 As student-athlete scholarship costs and the overall cost of providing the best possible UCLA student-athlete experience continue to rise, UCLA Athletics would not be a leader in the NCAA without the support of each and every Wooden Athletic Fund member. 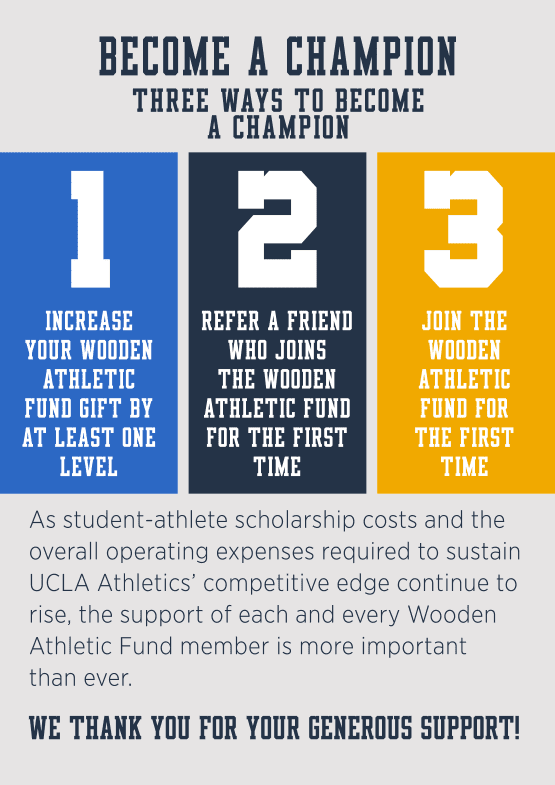 Here is how your support of the Wooden Athletic Fund positively impacts nearly 700 student-athletes at UCLA. The Wooden Athletic Fund has set its sights on a new milestone in support of UCLA's student-athletes: 10,000 WAF members. 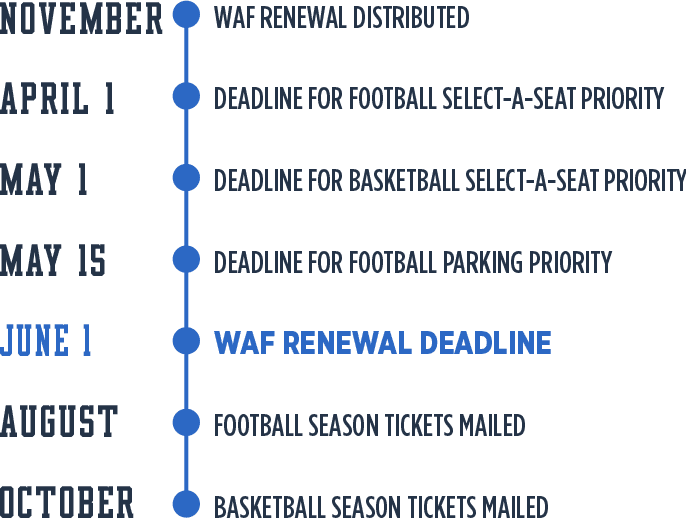 As we approach 10,000 members, special incentives will be offered to current WAF members who refer new members to join as well as to new donors themselves. All new WAF Members and current donors who "Become a Champion" receive an exclusive WAF Member Under Armour hat. 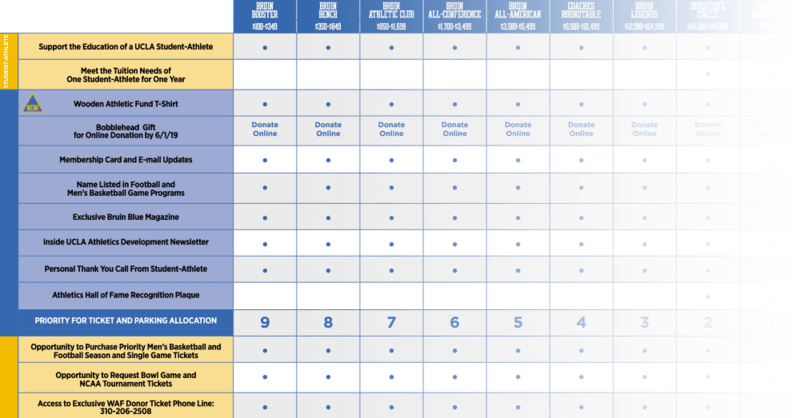 THE CHART BELOW OUTLINES WOODEN ATHLETIC FUND DONOR PRIORITY RANKINGS AS OF JULY 1, 2018. 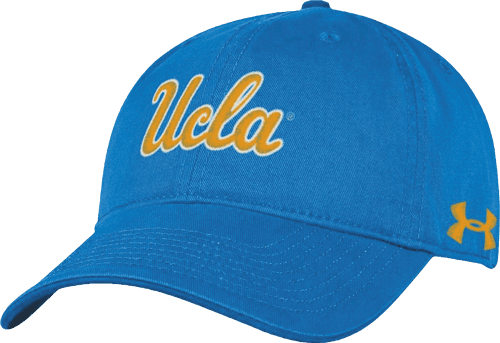 You can directly support any of UCLA's 25 intercollegiate teams with a gift directly to the annual operating fund of a specific sport. Benefits for donations to individual sports vary based upon the sport and do not include priority seating opportunities for Football or Men's Basketball. In recognition of gifts of $25,000 or more to a single sport, donors are offered non-seating Wooden Athletic Fund benefits in addition to the benefits provided by that sport. 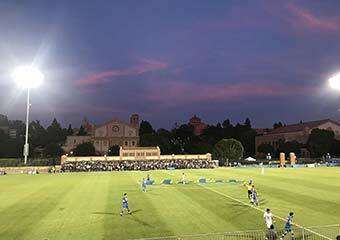 Opened in August, 2018, the first phase of the Wallis Annenberg Stadium project includes grandstand seating and a press box on the west side, a Daktronics LED video board and Musco Sports lighting. Future phases of the stadium project may include expanded stadium seating, a training room, student-athlete locker room, coaches’ locker rooms, meeting spaces, ticketing space, and a new press box. Click the button below for more information on available naming opportunities. Forever Champions Scholarship Endowments allow you to create an everlasting endowment, supporting the educational and athletic experience of UCLA student-athletes for years to come while enjoying lifetime annual Wooden Athletic Fund credit to be applied to UCLA Football and Men's Basketball Scholarship Seating requirements. 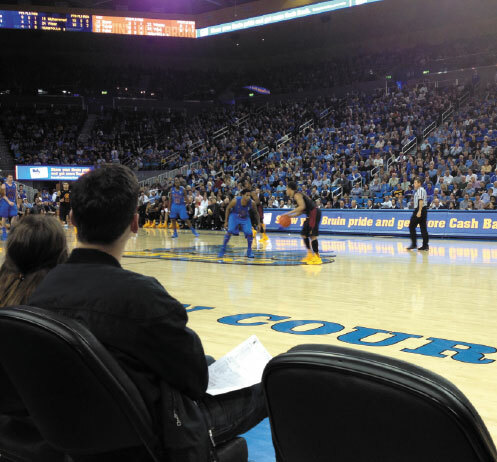 Car dealerships providing vehicles for use by UCLA coaches and administrators are eligible for a wide variety of benefits including recognition at events, team travel, and priority seating opportunities. The following options are available as alternatives to outright gifts of cash or property: charitable remainder trusts, charitable gift annuities, deferred gift annuities, charitable lead trusts, pooled income funds, life insurance and bequests. Detailed information on each of these options is available by consultation with our Development team at 310.206.3302. 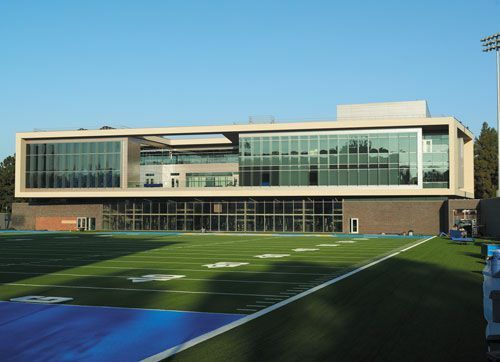 The Bruin Varsity Club provides an ongoing connection to campus for former studentathletes with events, mentoring programs with current student-athletes, and networking opportunities. 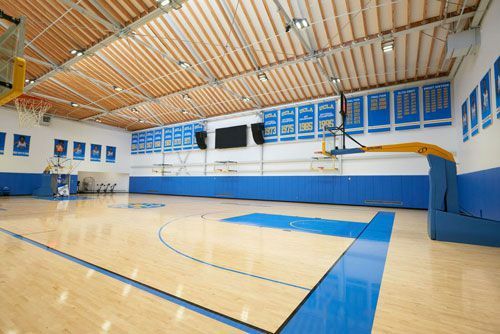 Former UCLA letter winners who support the Wooden Athletic Fund with a gift of at least $100 will receive Bruin Varsity Club Premier Level benefits in addition to all regularly offered benefits of that giving level in the Wooden Athletic Fund. 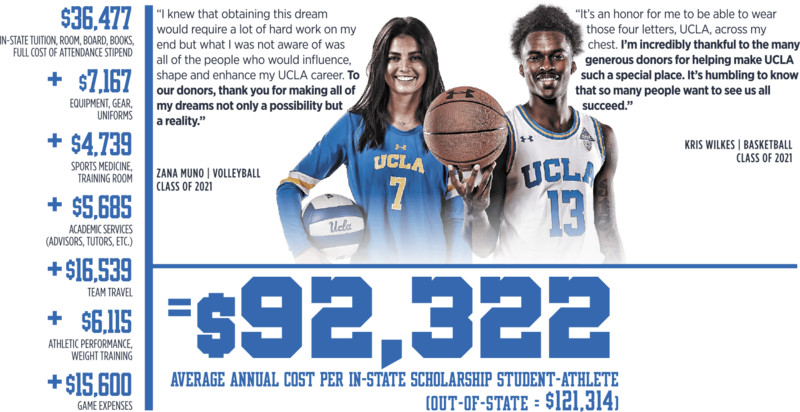 The Wooden Athletic Fund is the backbone of UCLA's financial commitment to support the educational and athletic excellence of each student-athlete who competes for the Bruins. In recognition of their financial support, Wooden Athletic Fund members are offered a wide variety of exclusive benefits including access to tickets, parking and hospitality. Gifts of $25,000+ annually to the Wooden Athletic Fund, an Individual Sport, or a Capital Campaign qualify for Premium Benefits included in Director's Circle membership. Arrive in style at Pauley Pavilion with priority entry and exit to and from our exclusive valet parking in Lot 7, the closest lot to Pauley Pavilion. Gifts and membership at the Director's Circle ($25,000+) or John R. Wooden Benefactor (50,000+) levels provide the support needed to fund the tuition for a student-athlete for an academic year.